Beer, snacks & Cumbrian tipples. 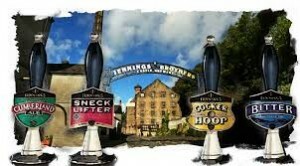 As the great granddaughter of a Kendal Innkeeper I thought it appropriate to share with you some local knowledge of fine Cumbrian hostelries, breweries & tipples. This entry was posted in Blog and tagged brewery, cumbria, damson gin, distillery, kendal, mint cake, tapas on 03/07/2015 by Alison Mason.